Emily and Tom live on Hillside Farm where they help their dad with chores like cooking and gardening and feeding the animals. The children lost their mother many years ago, and they like to visit a Cyprus tree on the hillside nearby, planted by their dear mum. When the First World War descends, Emily is heartbroken when Tom makes the decision to enlist. Tom promises he will write, and he does—he sends his little sister countless letters—all at once charming, funny and heart-breaking. In one particular letter, he sends Emily some tree seeds. She folds them inside the letter and tucks them high on a shelf in the kitchen to keep them safe. Then Tom’s letters stop coming. Terrible news arrives, and that very night, on the top of the nearby hill, their mother’s Cyprus tree is struck by lightning and comes crashing down to the ground. The loss of a child, a brother, a son—a more intense metaphor could not be found. Gather up the tissues. This is more than just a story of one family’s heartbreaking loss—it’s about the way war infiltrates the lives and souls of those ‘left behind’—and also our future generations and the very lives we live today—many, many years post-World War I. It’s also about the importance of new life and new growth to help us deal with grief. How vital it is to honour our fallen by starting anew—and so, young Emily plants the seeds Tom sent her—and we know Tom’s memory will continue to live on. 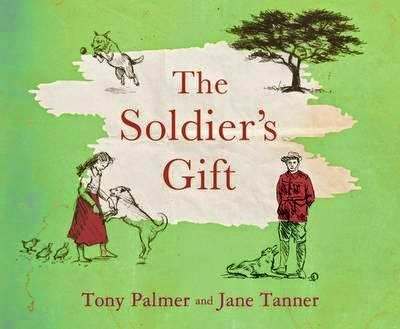 Tony Palmer’s gentle text is beautifully rendered in Jane Tanner’s stunning, realism illustrations, that place the reader firmly in both the dry, windy farmlands of Australia, and the terrifying trenches of Gallipoli. The Soldier’s Gift features addendum pages full of fascinating information on how the War affected those left behind—far from the frontline. Beautifully-designed endpapers host historical imagery including photographs of Queen Victoria, letters, newspaper clippings and personal mementoes like locks of baby hair. This gorgeously-illustrated, cloth bound book with stunning embossed cover would make a wonderful gift to commemorate the anniversary of the commencement of World War II.